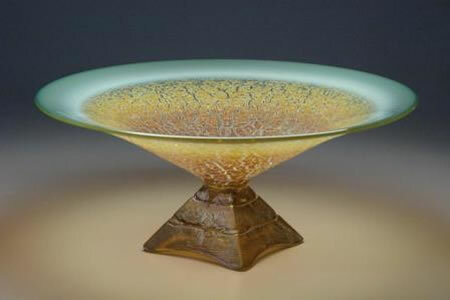 I came across the glass creations, like the piece shown here, from Willsea O’Brien Glass at the West End Gallery in Corning. 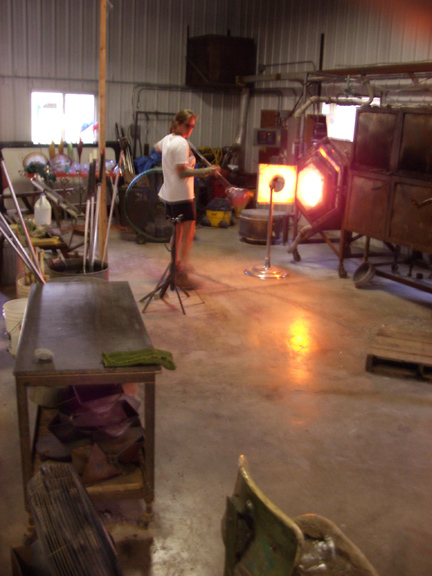 With Corning’s notoriety as one of the glass capitals of the country, the gallery carries a select few glass artists, all unique and extraordinarily talented. When I saw the Willsea O’Brien pieces, I was immediately taken in by the beautiful, complex colors that ran through them, jades and ambers and golds. The forms themselves had a classic architectural stability and solidness while still feeling light and graceful. There was just a real sense of rightness in the work, a feeling that this was work that would be as vital anytime in the future as it was at that very moment that I was first looking at it. Over time, I discovered that we were mutual admirers of each other’s work and arranged for a visit yesterday to their home studio in a hollow in Naples, a gorgeous area nestled in the Finger Lakes. When we arrived, the married team that makes up the company, Carol O’Brien and Paul Willsea, were in the midst of a piece. They worked in an almost silent graceful dance, perfected in the twenty-some years they had been creative partners. 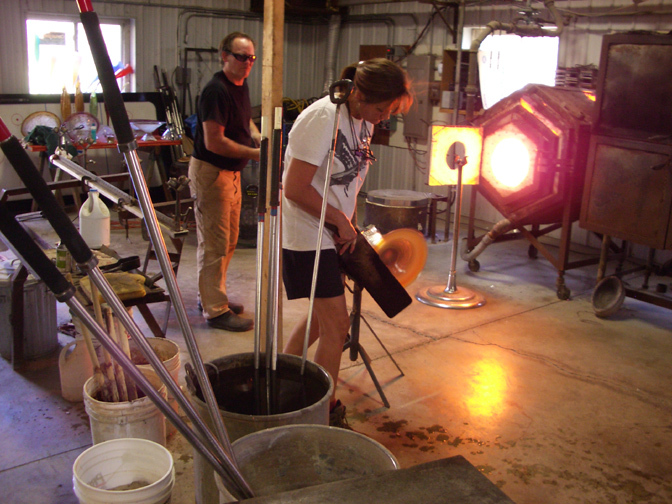 Working in the heat of the several glory holes and kilns, the two took what appeared as just a blob of glass when we walked in the door and transformed it within a short time into a version of the bowl shown above. I can’t describe in technical terms all the steps that they went through but it was remarkable to see supremely talented people working their craft with such ease. It’s one of those things, like watching carpenter Norm Abrams on This Old House. They make it seem so simple with the sureness and economy of their movements that you begin to believe that you could do that too. Then you try it and you realize that that ease that you saw was the result of thousands of hours spent at their craft and your appreciation for their talent only grows. We had a great visit yesterday and were able to find out a but more about their history and how their work has evolved (and continues to evolve) since their early days as a team in Oakland, CA before returning with their children to New York, the original homes of both. In their idyllic home setting, they have developed their own look and visual vocabulary in their work and have gained well deserved renown across the countryfor their unique pieces. If you are looking for beautiful objects that are also timeless pieces of art, you could not do much better than the work of Carol and Paul. Thanks to both for a wonderful visit. WHAT A GREAT COMPLIMENT TO YOUR WORK. THE BOWL IN THE PICTURE IS BEAUTIFUL, AND REMINDS ME OF ANTIQUE WORKS THAT SURVIVE TIME. I LOVE THE LOOK. I PRAY FOR YOU AND THE FAMILY, AND HOPE ALL IS WELL. I AM SO PROUD OF THE TALENTS THAT WE HAVE IN OUR FAMILY.